Here is the finished quilt top for my bars quilt. I’m really happy with the colors and the loose feel of the design. I was thinking of using Lotta Jansdotter’s Glimma in Slate for the backing, but I think it might be too dark. What about Simpatico wavy stripes in peach? Too gentle compared to the front? I’ve been inspired by all the interesting choices of binding I’ve been seeing lately. I think there a lot of options with this design. I’m looking forward to finishing this one! P.S. It has rained every day in July here in Gainesville, FL, so all my photos have been light challenged. Hoping for sunnier days ahead! This entry was posted in quilts and tagged bars quiilt design, Lotta Jansdotter, modern quilt, quilt design, quilt top on July 31, 2013 by brigitdermott. If I had to pick, I’d go with the On-Point for the backing. Something with more movement that would contrast with the front more than the other designs. This is just the kind of think I want to try. Something with plenty of room for quilting in the negative space. Thanks for sharing! Thanks, Becca. Something with contrast is a great idea! Love the simplicity of your design! Thanks, Debbie! Likewise–I love Still Thinking Positive! I love the idea of using Glimma in Slate! That would be beautiful! I am recently getting into binding myself! There are so many fun options! You’re referring to the “Straws”, I suppose, as second fabric choice. Actually it’s the one I’d be going for. It adds a nice touch of contrast. 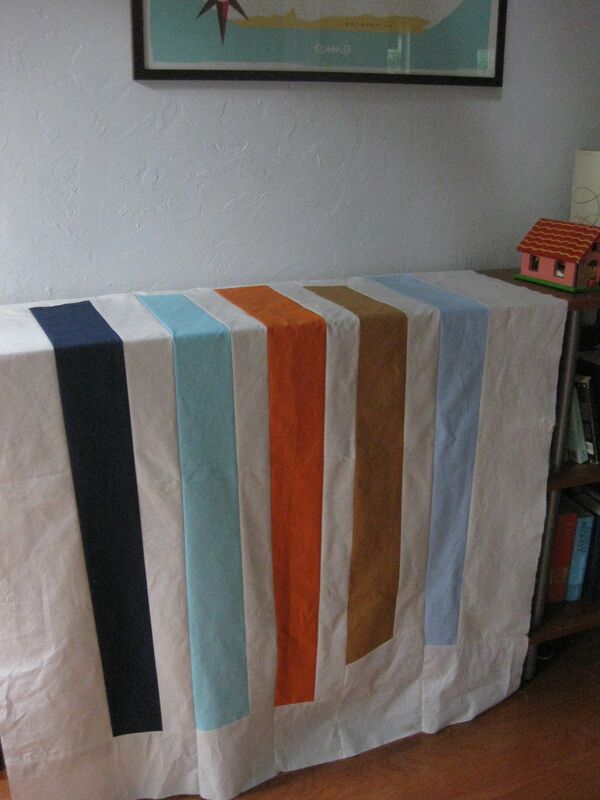 Do you plan any special quilting for the bars? Amish-Style or as modern as the colours? Thanks, Julia! Yep, it is Straws and I think you’re right. Some form of straight line quilting. I don’t have the patience or the right machine for really ornate patterns!